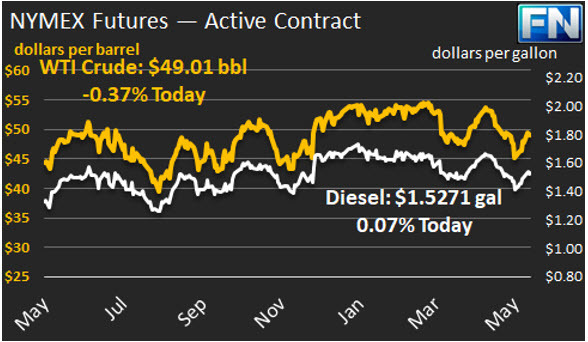 WTI crude prices are back in the vicinity of $49/b this morning, with yesterday’s downturn reversing this morning. WTI opened at $48.23/b today, a drop of $0.59, or 1.21%, below yesterday’s opening price. Current prices are $49.01/b, $0.35 above yesterday’s closing price. 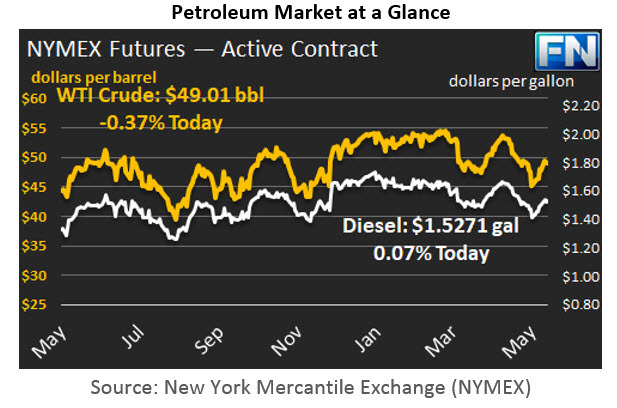 Crude and product prices had strengthened for four consecutive sessions until the streak was broken this morning, but both crude and product prices have recouped some of their losses since market opening. The recent price rally began last week when the Energy Information (EIA) released its weekly supply report, showing crude and product inventory drawdowns. Prices received another boost when the Saudi Arabian and Russian Energy Ministers announced support for a nine-month extension to the OPEC-NOPEC production cut agreement. U.S. production and the active rig count, however, continued to rise, indicating that the supply overhang would persist. The price rally flagged yesterday upon the release of the API’s report on inventories. The market had anticipated a drawdown of both crude and products. However, the API data reportedly showed a crude stock build of 0.882 mmbbls, a diesel stock build of 1.8 mmbbls, and a gasoline stock draw of 1.8 mmbbls. The EIA will release official data later today.